Just north of Denver in Fort Morgan City, the city council has proposed the idea to provide free mulch to local residents. This mulch would be coming from all the tree trimming that the city does on a regular basis. Usually this falls to workers from the power company who have to safeguard against trees limbs crashing down on power lines. Some folks hate it when the wood chippers are fired up in their neighborhood because it means trees might be coming down. But wouldn’t it be worse if the power went out? Those wood chippers create a perfect mulch that can help a garden grow. Instead of piling it on city property, it makes sense to give it away to anyone who wants the stuff. Just like here in Denver, those workers clearing away branches and trees are doing it on city property. That property might include telephone and power lines that run through your backyard. However, for the most part, homeowners are left on their own to handle their own tree trimming. As recent storms have shown us, Mother Nature doesn’t discriminate when it comes to toppling trees. Any tree, bush or shrub that is soaked with rain or melted snow becomes vulnerable. A hearty wind can kick up and knock those greens over in the blink of an eye. If they fall on homes, cars or power lines they can cause series damage. That’s why you should always maintain the trees on your property to make sure they don’t become overgrown or overhang onto sensitive areas. A typical Junk King removal assignment involves clearing out junk from people’s homes, garages, attics, basements and/or closets. The Junk King would love nothing more than to load up their truck with your old furniture, appliances, boxes or bedding but they don’t have to stop there. The Junk King Denver CO crew can also cart off all your landscaping debris. Yes, piles of dirt, chunks of concrete and anything else you might have in your backyard can all be taken out by Junk King. Don’t worry about doing any of the lifting or getting dirty; Junk King nver Dewill happily take care of all of that for you! This entry was posted in Denver Debris removal, Denver Junk Removal, Denver Yard Waste, Junk King Denver, landscaping cleanup and tagged Denver Landscaping Cleanup, Denver Yard Cleanup, Denver Yard Waste Removal on March 28, 2013 by Paul Durant. Last updated August 1, 2017 . How much practical use are you getting out of your backyard? A yard is an important part of your property especially in the warmer months. That’s when you can relax outdoors, invite friends over for a cook-out or have some place for the kids to safely play. Over the years, your backyard could have worn down from abuse from the weather. Why not give your backyard a makeover? Not only will this make entertaining more pleasurable but it will also increase the value of your home. Among the popular choices for a backyard makeover would be to replace a cracked patio with newly poured cement. The same could be said for your driveway or sidewalks. If they are cracked they’re not going to repair themselves. Depending on the circumstances, a crack in the sidewalk can also be a tripping hazard. Putting in a new patio or driveway doesn’t have to be complicated. In fact, what some consider the toughest part of the job is actually made easier thanks to Junk King Denver. 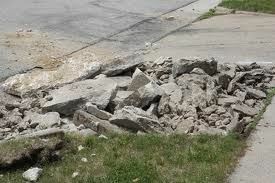 We’re talking about getting rid of all that busted up concrete and that’s a job that has Junk King written all over it! The first step is to break up the concrete. If you were hoping to throw those pieces out in the garbage think again. There is a weight limit to what you can toss out. You might be able to get rid of a single chunk every week which means it would take you months to get rid of all that concrete. Junk King has no weight restrictions when it comes to waste removal. Whether you’re getting rid of an block of cement or an old refrigerator it’s all the same to Junk King. Best of all, you could break up your patio and just leave it for the Junk King crew to pick up. In other words, you don’t have to make a pile of rocks, the JK Denver crew will pick up the concrete where ever it ends up! 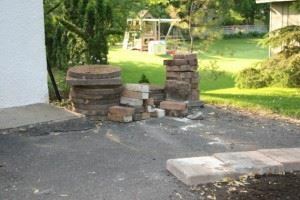 Getting rid of concrete is not the only job you should hire Junk King for. As mentioned, they don’t care what you’re throwing out. If you want to get rid of old furniture, a mattress, skis, a kayak or even a hot tub the Junk King crew will be up to the task. Once the truck is loaded, you can wave good-bye to the crew but they’ll still have more work to do. They’ll be dropping your junk off at a certified recycling center. That even includes your concrete. If something you’re throwing out can be repurposed and reused then Junk King Denver will make sure it happens. That’s good for you and good for Denver! This entry was posted in Concrete Disposal, Denver Debris removal, Denver Junk Removal and tagged Debris Disposal Denver, Denver Concrete Disposal, Denver Construction Debris on March 15, 2013 by Paul Durant. Last updated August 1, 2017 .